Do you have questions about Lucid Dreaming Adventures? No problem, we have answers! What are Lucid Dreaming Adventures? How should I listen to each CD? Won't I feel tired after having adventures each night? Where can I learn more about lucid dreaming? Tell me about your 100% satisfaction guarantee! Q. What are Lucid Dreaming Adventures? Lucid Dreaming Adventures is the name we give to our special range of lucid dreaming CDs. Each CD is designed to help induce a certain type of lucid dream – for example, a lucid dream of flying, or a lucid dream in which you meet your hero. 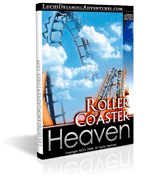 Every CD lasts for around 60-70 minutes and contains a special visualization script, and reality prompts – quickly guiding you into lucid dream, and taking you on the most awesome adventure of your life! Combined with specially developed brainwave entrainment tones, and music by world-famous composer Max Andranov – these CDs GUARANTEE you'll be experiencing the Lucid Dreaming Adventure, with absolutely NO effort! Anything is possible: Take a white sand vacation... Enjoy the world's most thrilling roller coaster rides... Travel back in time and discover your own "Jurassic Park!" Just play the CD on loop as you fall asleep – and get ready to be amazed. 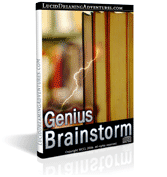 With Lucid Dreaming Adventures, it's literally THAT simple! Q. How should I listen to each CD? It couldn't be easier to start your Lucid Dreaming Adventure! Simply play the CD as you fall asleep. That's all you need to do. We HIGHLY RECOMMEND that you play the CD on loop for the optimum experience. Headphones are NOT required: the brainwave entrainment is obtained using monaural beats, rather than binaural beats. As such, you can listen with or without headphones – whichever is most comfortable for you. Q. Won't I feel tired after having adventures each night? In fact, most people report feeling even more ENERGIZED and INVIGORATED after spending the night enjoying themselves in their dreams. Lucid dreams happen entirely within the mind, and require absolutely NO physical effort whatsoever. Your sleep isn't disturbed at all. This dreaming would happen regardless. With lucid dreaming, you just become "aware" of it, and help to control and direct the dream. You'll feel great after your Lucid Dreaming Adventure. We guarantee it! Q. Where can I learn more about lucid dreaming? Bradley Thompson is the author of "Lucid Dreaming in Seven Days" – the authoritative guide to getting started with lucid dreaming in the quickest time possible. You can learn more about the book, and Bradley's lucid dreaming software and Audio Stimulation CD, online at www.lucid-dreaming-kit.com. THURSDAY BONUS: If you purchase ANY of the Lucid Dreaming Adventures CDs TODAY, we're offering the FULL version of the Lucid Dreaming Kit for just $49.95. That's $10 off the retail price of $59.95. Just click on the special link at the bottom of your basket page! We know you'll be amazed by the Lucid Dreaming Adventures range. That's why we're offering EVERY customer a NO questions asked, NO quibble customer guarantee. Try out our CDs for a whole month. If you're NOT absolutely THRILLED at the results you're getting – simply return within THREE WHOLE MONTHS for a complete refund (minus our original S&H). The guarantee is backed by the WCCL Network, the publishers of this package. Q. How quickly will I receive my order? We'll send your CDs out on the day you order! If you live in the UK, you'll receive your package within a couple of days. If you live in the United States or other countries, you'll receive everything within 7-10 days. We provide 24/7 assistance via our dedicated support site at myHelpHub.com. Our team is available around-the-clock to help with your queries. So if you have extra questions, please click here to contact us. We promise to respond to all messages within one business day, however our typical response time is just four hours. Ask Da Vinci for ideas! Do NOT use if epileptic, or you need to stay awake. Read our precautions & disclaimer. Copyright ©2019 WCCL. All rights reserved.